Carvings from various parts of the Persian Empire displayed soldiers wearing ear rings. 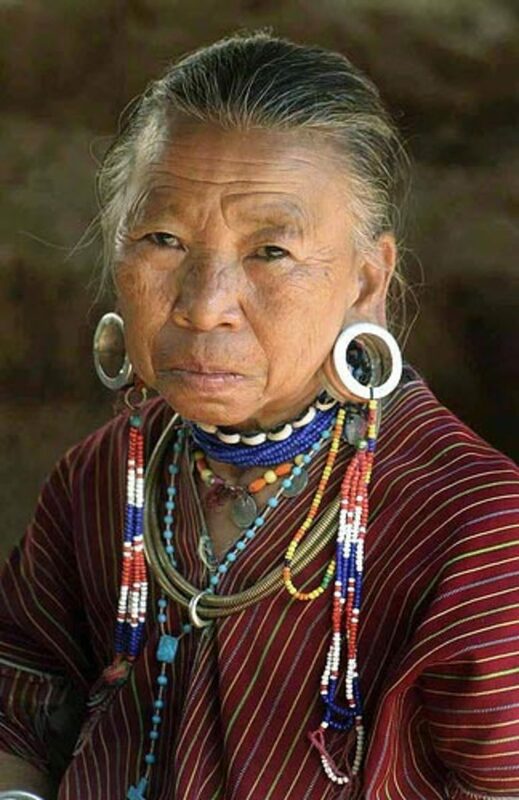 Tribes would perform ear piercings, among other kinds, as a rite of passage, whether it be puberty, marriage, or war. In southern India, most children have their ears pierced before they were five years old. Today, many children get their ears pierced around seven months to one year of age. Ear piercings also extend further than just the lobe. Today, we have industrials, rook, daith, helix, inner, and outer conch, anti-tragus, orbital, and reverse lobe piercings. The healing process, after you've gotten your ears pierced. The different kinds of jewelry that are available. Most piercers will recommend cleaning the jewelry and area around the jewelry with a mild soap while in the shower. Make sure to thoroughly rinse it. You do not want to leave any soap to irritate it. You can, also, clean with saline. Soak a cotton ball, and hold it to the piercing for 10- 15 minutes, 2-3 times a day. Try not to play with the jewelry unless you are cleaning it. The more you irritate it, the harder it will be to heal. Do not over clean, as drying it out will, also, irritate it. The average healing time for most ear piercings range from 6-10 weeks. Cartilage piercings take longer to heal. 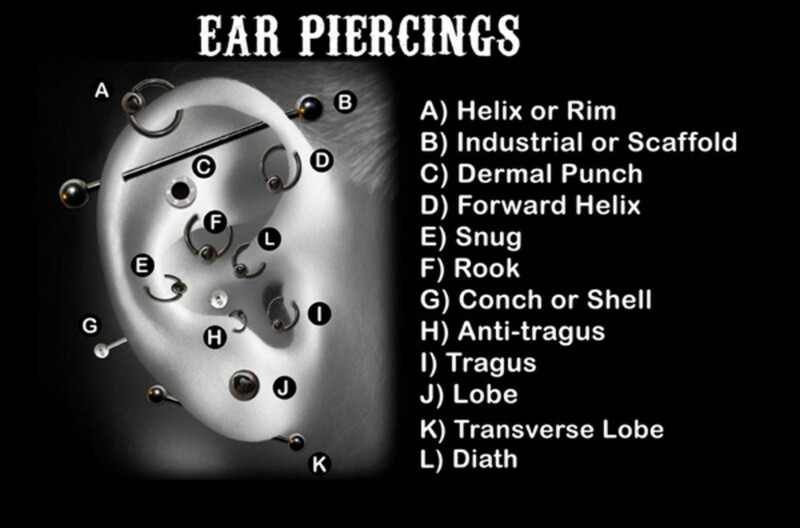 Lobe: This can range from a single piercing to several. 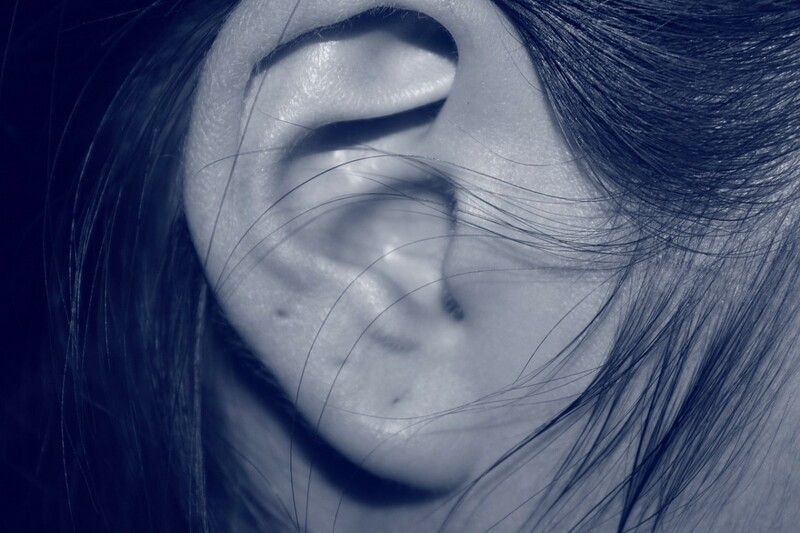 It's fastest to heal, and usually placed at the fleshy portion of the bottom of the ear. Industrial: A barbell pierced through two sides of the ear. The standard industrial crosses the top of the ear. Inner Conch: A barbell or CBR pierced through the inner portion of the cartilage. Daith: A piercing made through the inner-most ridge of cartilage above the tragus. The daith is not subject to pressure from sleeping and irritation from daily activities. Helix:Through or around the upper, curled edge of the ear, including the curled edge towards the face. 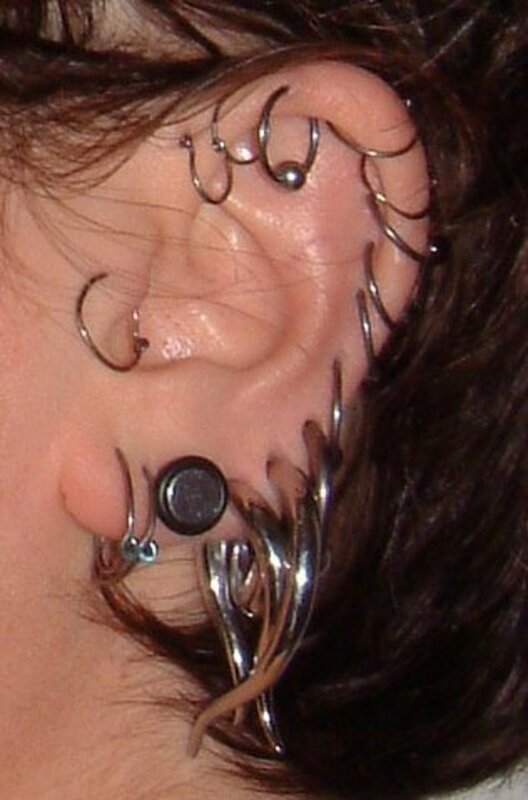 Rook: Pierced through the antihelix, the ridge above the Daith ridge. Prone to rejection/migration. Snug: Horizontal piercing of the antihelix, across from the tragus. Tragus: Prominence of cartilage in front of the opening of the canal. Tends to take up to 12 months to heal. Captive Bead Ring (CBR): A ring with a gap left to insert the ring through the ear. A ball to sits in the gap once the jewelry is in. Circular Barbell (Horseshoe): Similar to the barbell, with one permanent ball on one end and a screw in ball on the other. But, the barbell is bent in the shape of a horseshoe, leaving the jewelry easy to insert and remove. Banana Barbell: Sometimes banana barbells are used. Similar to a regular barbell—with one permanent ball and a screw in ball, except the barbell has a slight curve to it. Flesh Plugs: Short cylinders with flared ends to hold them in place. Some require small rubber rings (O-rings) to keep them in place. Flesh Tunnels: Also called eyelets. Similar to flesh plugs, but they are hollow in the center. Studs: Studs are very difficult to clean thoroughly. The butterfly clip backing can become clogged with hair, discharge, and dirt. 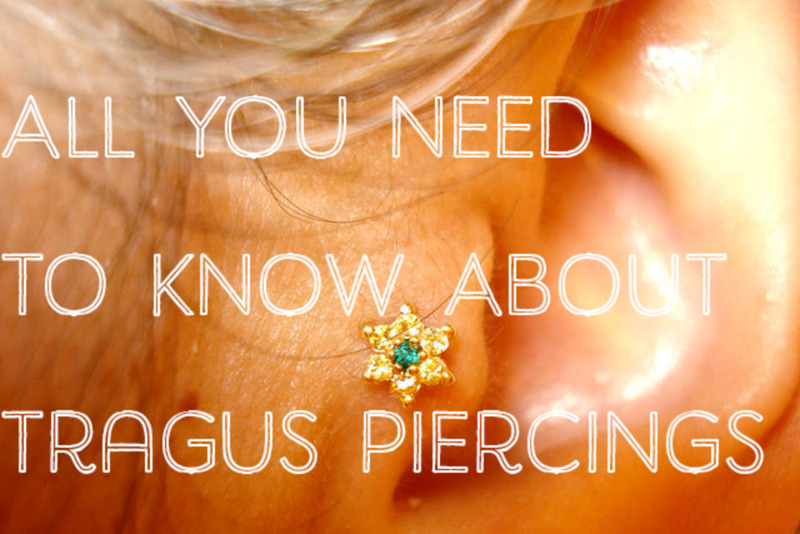 This make the piercing more prone to bacteria and infection. Clean the piercing once a day in the shower. Check it every morning to ensure that your hair hasn't become entangled in the jewelry. Be careful not to knock on it while it is healing. Use clean pillowcases and bedding to reduce the likelihood of bacteria getting into the wound. Turn the ring in the wound for the first 2-3 weeks, as this aggravates the wound. Remove the jewelry during the healing phase. Pulling it in and out can increase the likelihood of infection. Put methylated spirits, tea tree oil, peroxide, betadine or alcohol onto the wound as they are too astringent or damage the cells which form the scar tissue. Get hairspray or cosmetics on it while it's healing. The piercing gun was originally intended to be used on lobes only. 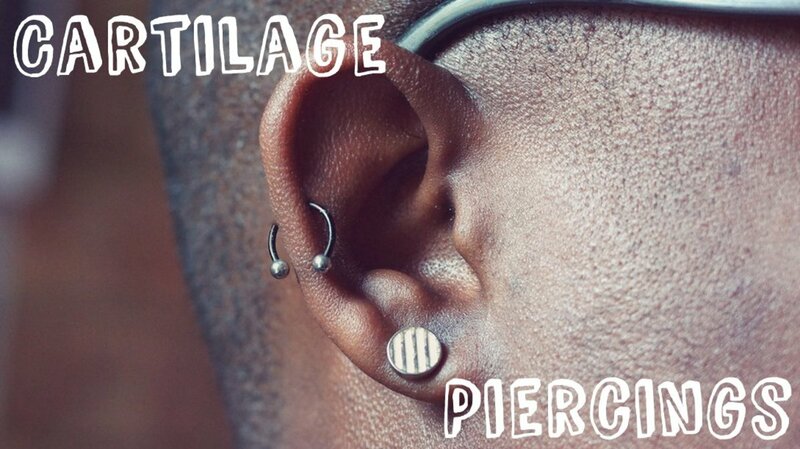 But, the piercing studs are usually too short to accommodate swelling and thicker earlobes. Piercing gun procedure can cause tissue traumas. The studs are considerably dull and can literally tear a hole through the tissue. A cleanly made hole is especially important in cartilage piercings. Most importantly, cleanliness is questioned. Ear piercing guns are often made of plastic which cannot be properly sterilized in an autoclave. Simply wiping it with a surface disinfectant between clients is not adequate when the piercing gun could have possibly been exposed to blood borne pathogens. Although the studs themselves may be sterile, piercing guns which touch the lobe before and after the procedure can be easily contaminated with blood. The gun may also be indirectly contaminated if the piercer touches the studs after they are installed, and then touches the piercing gun without changing gloves. Piercing needles are hollow, beveled, and sharpened similarly to the hypodermic needles. Most are about two inches in length. Piercing needles slice a crescent-shaped hole, and do not remove any tissue. Because single-use needles are very sharp, they easily glide through the skin, causing very little, if any, tissue trauma. Needles are autoclaved appropriately before use, and are only used once. Using needles is much more sanitary, and causes less trauma to the body than a piercing gun. Stretching any piercing can be a permanent move to undertake. 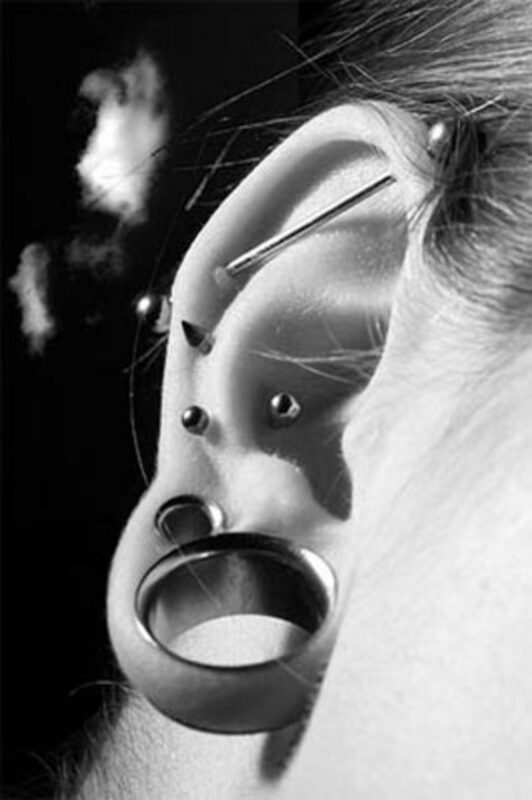 So, before stretching a piercing, make sure that you know what you want and can live with the enlarged hole permanently. 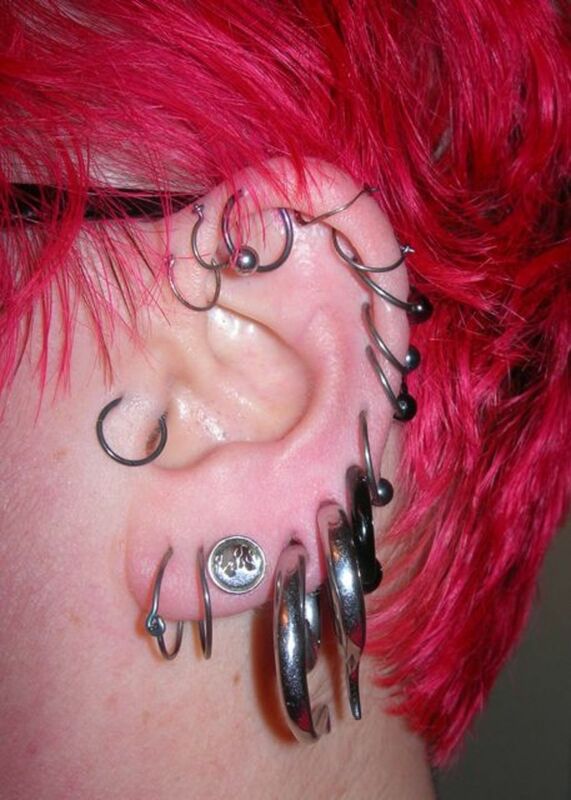 When stretching a piercing, any piercing, make sure that you only move up one gauge at a time. Meaning if you're at a 14g ring, you will want to purchase a 12g ring. Slow and steady wins the race. Never rush a stretching. Make sure to let the newly stretched piercing heal and relax for at least two weeks. When stretching too quickly too soon, you can suffer ear tears, ear blowouts, and infection. If you choose to attempt to close an enlarged piercing, leave it free from any jewelry. If the piercing is noticeably large, (I'd say over 0g), you can insert smaller gauged jewelry to make the hole less noticeable until the hole is smaller or closed in. Also. remember that larger gauged ears will never shrink fully back to size once you hit the end of no return point, which is usually a 0 gauge hole. It will take much patience to close a piercing fully, especially one that has been stretched. I got my ears pierced 4 days ago and they are slightly hot and a little sore to twist, as I am supposed to. Should this be happening? I clean them 3 times a day as well. My earring got infected in the night.I'm a child and all my family members are asleep,I don't want to wake them.My ear is puffy,red,painful and I am scared to take it out for the rst time.I got my ears peirced in May but still.It is 12:45 am.I need help and fast.My worst fear is that my earring will get stuck in my ear.It gets stif and I have to turn it every 5 mins.WHAT DO I DO!!!!!!! I had my second earlobe and cartilage pierced 11 month ago and there is still pain. I can't understand if it is normal or not or it have been infected. Pls tell me if its normal or not? I'm really tensed about that. I've had my cartilage pierced for almost 2 years now by a professional. He pierced it with a small stud I finally changed it because I want something noticeable. It's a cross now not huge but bigger then the last jewelry but now it hurts whenever I touch it or sleep or my hair touches it. I've had it changed for a couple weeks now. Does it hurt because it's bigger jewelry? Its been 7 weeks but there is still some clear pus coming out of my lobe piercing (pierced with a gun) if I took out my earrings, would the tissue close right away? i had my cartlidge pierced today how long do they take to heal ? I got my thirds and fourth lobes pierced 5 days ago, when can I change them? hey i got a double helix about 5 days ago. the ear is extremely hot and its kind of like a throbbing ache. ive taken panadol so i cant feel it now but the ear is still super hot and i have a feeling once the panadol wears off the pain may come back. the lady at the shop said betadine solution would be best if it continues to hurt still in a week, but here its says not too? is this normal and its just healing? or should i go back o the shop and ask what to do next? Okay so I got my ears pierced about a month ago and it isn't healed yet I want back to the piercer and she said that it is infected so I removed it as I was told the infection is all better but I want to put in hooped earrings what do I do? My daith had recently gotten infected and I was on an antibiotic for 10 days now it is so sore. Its not swollen, red, or infected. What could be causing this? I clean it regularly and when I smile it hurts my ear. Are you trying to stretch them? I would stretch one gauge at a time, so if it was pierced at a 14, use a 12 gauge piece of jewelry. So I got a ear piercing 6 months ago and today in class one of them started bleeding. I don't think it's infected because I cleaned it frequently during the healing period. How do I fix that? I'm getting my industrial piercing in two weeks and I have a huge worry about getting bumps on my piercing because my skin is so sensitive will that be a problem? Without twisting or turning the ring in the ear won't the skin go over or close over the ring or close around the ring? Alcohol will drive them out and can cause irritation. Clean with saline for the safest clean and healing process. The pain is normal. Try cleaning them in the shower. You may have dried lymph that's pulling when you're fiddling with the earring. Sooo I got my ears home pierced. My brother said to clean it with alcohal a few times a day. And then my mom says to turn them every so often so the flesh doesn't heal like around the piercing. (So like the piercing doesn't get stuck and can't get pulled out.) Then this says not to use alcohol and not to twist ur earring until the 2-3rd week. ;-; I'm on my 4-5th day with em. And I started turning them on the 2nd day. And I thought using alcohol cleans them well. Plus u can tell when there healed cause it won't sting anymore when they are. I got my helix done about 4 months ago and my peircing does not hurt it's not sore or any thing and I really want to change the earing. Could I? I got my ear lobes pierced about 3 or 4 days ago and my left lobe is hurting. I've been cleaning it 3 to 4 times a day like I was told. And I'm turning them. No puss is coming out or any liquids. It doesn't hurt at all when I turn it, it just hurts when I push up on the earring so I can clean it. What's going on? I got my inner conch pierced 6 months ago with a straight barbell and went to get it changed to a hoop two days ago. It's extremely snug and I can see it squeezes the outside of my ear about and can't really move it in any direction at all. I think my piercer may have had to go up a gauge and it hurts a lot, but I feel like most of the pain is from the outside of my ear being tightly squished by a hoop. I can't sleep on that side or touch my ear to anything and I've been consistently taking ibuprofen or aspirin through the day to help it hurt less. Is it becausethe earring is too snug that I'm in pain, or is it because the gauge is bigger? I can send in a picture if that helps. Thanks! I got my ear cartilage pierced almost a year ago and it still gets swollen and gets a bump on the back. Will it heal by the time the 12 months are up or should I just let the hole close? I got my outer conch pierced with a banana barbell about a week ago. And I was cleaning it with antibacterial soap and water like they told me too. It hurts to even touch the ear, bleeds when cleaned. It is also very red. Is that normal? If not when can I do to ensure it heals properly? Hi! I got a second lobe piercing when I was 16, so about 3 years ago. While my right lobe was sensitive for a few months, it healed just fine. However, over time my left lobe made it apparent that it was not going to heal. As of today it still isn't fully healed and is constantly getting infected. Along with this my left lobe swelled much larger than stud would allow and left a large indent around the piercing site. Would it just be easier to remove the piercing from my left ear and get a new piercing once it closes? i did the most worst thing anyone can do to their ear......i pierced my ear four times going up starting from the ear lobe......but i didn't use a needle or anything ....just an ear ring and pushed it threw....i did that a long time ago and once in a while i would get a key-lode but the new hole i made yesterday makes my ear kinda look like an elf ear....is that normal ? Hi! I got my helix pierced about 4 months ago with a gun... I don't know what size a regular earring is but is it safe for me to switch to an 18g or 16g? I got my ears pierced a few months ago, but I'm still having problems with my lobes. The infection seems to switch from ear to ear; when one ear gets better, the other starts hurting and producing crusty stuff around the piercing hole. My symptoms are: a little bleeding, crusty stuff (dried puss?) around my hole, soarness, redness, and when I take my earring out to clean the post with peroxide, the hole starts to bleed and close up. Im desperate for help!! Do you have any advice? My left ear lobe hole keeps trying to get smaller when I use my good earrings cause their smaller studs. So I wear the body jewelry now and have been for 2 years so how come my hole is trying to close up ? And when can wear my good jewelry ? I had my 3rd ear piercing yesterday and tonight I took my earrings out of my first and second holes and the second one on the right side of my ear was really painful and when I could eventually get the earring out it was bleeding is it to do with the new piercing? I took both my daughters to have their ears pierced at three months old. They have always looked so cute wearing earrings and the girls love their earrings. I wear two earrings in each ear and used to have my belly button pierced but I took it out when I became pregnant. I am sure it is best for little girls to have their ears pierced as babies. Is it normal for your ear lobe to bleed ( A tinny little bit ) after about a month after piercing??? I had my Baby ear pierced when she still 6 days old now she is 6 months and 9 days older. Since I notice the right side is not in the center, and I decide to leave it and ask again to have pierce back but on the correct route, A little bit higher than the previous hole. My Question is; Is it still possible for that wrong hole to close on his own since my baby is still @ 6 months old just wanted to correct or have it paired on other side. It's only been a few days, expect redness, soreness, and swelling. Give it a few weeks and if you're still a good bit of pain, there may be a problem, but it's still hard to say as everyone heals different. Hi I got my cartailige pierced 4 days ago and it's been really hurting ever since. I've been cleaning it morning and night just like he said, but if there's something wrong I'd like to know earlier rather than having an unwanted hole in my ear for the rest of my life. I got rook pierced yesterday and the ball near the daith has fallen out. will this be a problem, will i have to go back to the shop or can i just leave it?? I have accidentally pulled the string on my earlobe, Because i used the traditional way to pierce it. Now behind my ear there is a hard dry lump behind. whenever i turn the string it will be damn pain. May i know how do i solve this problem on my earlobe? I've bought HEXODANE ANTISEPTIC Cream but i do not know wherther it is effective anot. Hey I just got my ear stretched from nothing straight to 4mm, it's has slot of scabs and is fairly painful after like 8 or 9 hours. Is this normal? Or problem? I got my cartilage pierced with a piercing gun over a year ago and since I've had it done, I've had thickness around the piercing that's a lot like scar tissue. Theres also a puckering of the skin around the exit hole that I don't expect to get rid of. Sometimes a usually clear liquid will come out and when I sleep on it, the piercing hurts for the next day or so. I'm pretty sure it's not infected and it's just tissue trauma, I just wanted to know if there was a way to get rid of the thickness. I got my third piercing on my ear on thursday night and was wondering if I would be able to change earings? Hey i got my cartliadge pierced and i know i should know this but i want to change it to a stud but i dont know for sure what size to get?? There are soo many!! Ashley this is in response to your question I was raised around a piercing shop so this is my experience of what to do. Yeah put your ear in the sea salt and let it soak for 30 min. Just on the safe side wait 3 months in case problems arise but you can get it changed sooner. If you want specifics ask your piercer. He'd know the exact time of when you can change it. Hey, i just got my second piercing on my earlobes yesterday. I had 2 clean it with alcohol last night and this morning. But i bought the sea salt 2day. How do i use it ? They say 1 tsp. of salt and a cup of hot water? And how long do i wait b4 changing the earing ? My right ear hurts when i touch it but i guess that's only because i got it yesterday. Hey! I Just got my third piercing done on my lobe but it was swollen and when I touch it has like a lump and it was hard. What should I do? Help please!! T.T btw I got my five piercing on my lobe. Right ear - 3 piercings Left ear - two piercings all is done by a gun. I have no problem with all piercings except my third piercing which is now swollen. Please help ! Hi I got my second piercing done on my left lobe on Wednesday. It's Sunday now. My ear has been swollen a lot and I'm in Mexico. I've been cleaning it pretty well every day and I have been taking advil and prednisone to take away the swelling. Today there was no swelling in the morning but then I came back to our hotel later in the day and it had white puss coming out of it. I don't know what I'm doing wrong because I've cleaned at least four times a day... Is it an infection? So I recently gauged from a 0 to a 00 in my right ear, I did it on Sunday night and today(Friday) I went to clean it because it was slightly swollen and hurting. When I took out my plug to clean my ear, my ear started to bleed a lot. I know I did not blowout, but I'm not sure why my ear is bleeding. I can not wear earrings because I'm allergic to the metal, and the plug I was using was metal, could that be the reason? Also, Should I down size, leave it out, or just out it back in? soo i had my nose pierced before this but i took it out, well friday i just decided i wanted it done AGAIN so i get it done, and it will not stop bleeding! i did get it done on the same side, but not in the exact same spot. & i really dont think its normal for it to bleed this much, like its not just a little bit its a lot. I got my inner conch pierced about 5 days ago, the piercing didn't really too bad and it didn't bleed when pierced, after that it's been a bit sore but nothing unbearable. However yesterday it felt extremely itchy and i know i shouldn't be touching it but almost without realizing I did, and noticed a lot of dried up blood on the back, so I cleaned it with saline solution (as I have been, twice a day). I also noticed today that the inside of my ear by the whole was filled with blood both fresh and dry so I cleaned it up again. Is this normal or should I be worried? Oh and it's also been extremely itchy today! I had a helix piercing done about a year ago, with a needle from a well known reputable salon. I have a silver bar in it (no allergies to metal, have other flesh piercings that are fine). It seemed to heal ok but then changed. For the past 6 months it has been irritated and sore so I went back to the salon a couple of months ago and they told me it was just irritated and I needed to use gauze with warm salty water and a little pressure to encourage it to heal. It doesn't appear to be infected as just red, slightly swolen and sore (a small lump either side) - no puss etc. I was wondering if anyone has any suggestions? I don't really want to take it out as I quite like and am conerned this might not be the best thing to do. I've also put up with it for this plng. Please help! what's something i can do to make my ears shrink? i had 00s in and want to put standard sized earrings in, someone plz help!!!! My daughter had lobe piercings that NEVER healed. They pierced her left lobe crooked, we took it out, and had it redone the next day (this is the option they gave us) - yes, with a gun, didn't realize then the different options. We finally took the earrings out about two years later. I did't realize that infection could get trapped in there. She has a knot in the lobe that hasn't gone away (1 - 1 1/2 years later). She wanted "magnetic" earrings and I finally relented and they hurt b/c of the knot. I am now afraid of infection trapped in there? But if she has been on an antibiotic since then wouldn't it have taken care of it? Her ped. isn't help on "earring" issues. Thanks for your help! I gauged my ears to a 6 today and they are bleeding, they don't hurt or anything just bleed a little bit on the inside. I am scared that something is wrong even tho i'm sure it's fine because my belly button and ears both bled for a couple weeks, i think i just bleed a lot but i am still worried!? any suggestions? Uh, piercing guns R GREAT! when i get my done they throw the gun away and use a new one for each different piercing! i just got an industrial piercing yesterday (dec 29) and i have swimming classes on the 6 of jan. is it bad to have this soaked in chlorine water? also my school doesn't permit piercings and i think their goes my professor as well, anyway can i remove it in the time period i am in the water then place it back on ryt away? could you advise me on what safety measures i can do to avoid irritation? we are required to ware a swimming cap so i think it will hurt if i try to hide it. I just got my ear pierced. I got the industrial piercing. But its WAYY too low. I might get it fixed at a different mall on friday, but im startin to like it. I dont know what to do. i got my rook pierced on saturday and he used a CBR hoop. he left it with the ball of the hoop aimed outwards, instead of down (if i were to twist it i could aim it down but it is a little swollen so i cant move it). anyway, should i rotate it when it is healed so the ball is on the bottom, or can i leave it aimed out, in the middle of the hoop? Don't be ignorant. Get the piercings properly pierced. hello. Soo i just gaughed my ears to a 6 after having a 12 in for a couple of days ( my ears were pierced when i was a baby so by now they were already a 10 ) , im not experiancing any pain or discomfort, but when i took out my left taper to clean it, it was bleeding a little and i could see the "white" meat inside my ear. Is this a blowout or normal? Im not sure on what to do? is 4weeks and 3 days enough to switch out earrings ? I just got my ear pierced (left Lobe) and got a captive bead ring. however, last night it got snagged on a zipper attached to my pillow and it killed. Also I don't think my job would really like the look of the CBR. I just got it pierced yesterday. (with the needle at a professional parlor.) Is it too dangerous to change it to an earring that doesn't dangle, like a small black stud or something? Daniela, sometimes admitting you were wrong is better than putting yourself in harms way. The only thing you can really do is to clean with saline solution. By taking it out, you can potentially block any infection in the body, which can cause problems. It may close up if you take out the jewelry. You are further irritating it by taking out the jewelry and putting it back in. Saline and crushed aspirin are my only suggestions besides going to a doctor. Hi i had my helix pierced about 4-5 weeks ago,it is healing well. I want to know how long must i leave it before I get another piercing to the same ear? I want my Rook piercing next.I didn't get much swelling with the Helix and there is no swelling now,with very little exudate now. Hey, about 6 weeks ago I got a cartilage piercing on my ear and it was fine until about a week ago when it started to swell up and hurt a lot. This is probably due to the fact that i didn't really clean it properly. I cleaned it with alcohol a few days ago, which I know I probably shouldn't have done. Then, today I took it out as I couldn't stand the pain anymore and i was bleeding on the back so I cleaned it with hydrogen peroxide which I probably also shouldn't have done judging by the recommendations not to use such products on other websites. It's not infected yet but I feel its about to be. Is it possible that I can treat this swelling without having to close the piercing? What should I do? Visiting the doctor isn't really an option as I'm underage and would need permission from my mom who would get really angry if she knew I wasn't taking care of a piercing she hated in the first place. Is there any over-the-counter medicine I could take or any home remedies? I thank you in advance and look forward to hearing a reply. I got 4 cartilage piercings (2 on each ear) on monday. Now it is the next week saturday. My ears are HUGE! The swelling started yesterday up to this size. Like the whole ears excluding the lobe. They're swollen until they move to the front as if i have monkey ears. I just went to the doctor and he gave me antibiotics and some cream for irritation. And now my ears seem to have tiny dots all over the back filled with this clear yellow liquid that oozes out. Is that lymph? Does it mean that the swelling is gonna go down?? Please reply! Sbabyy, the odds of infection are pretty good. Clean with a q-tip dipped in saline or a diluted non-iodized sea salt (not table salt). 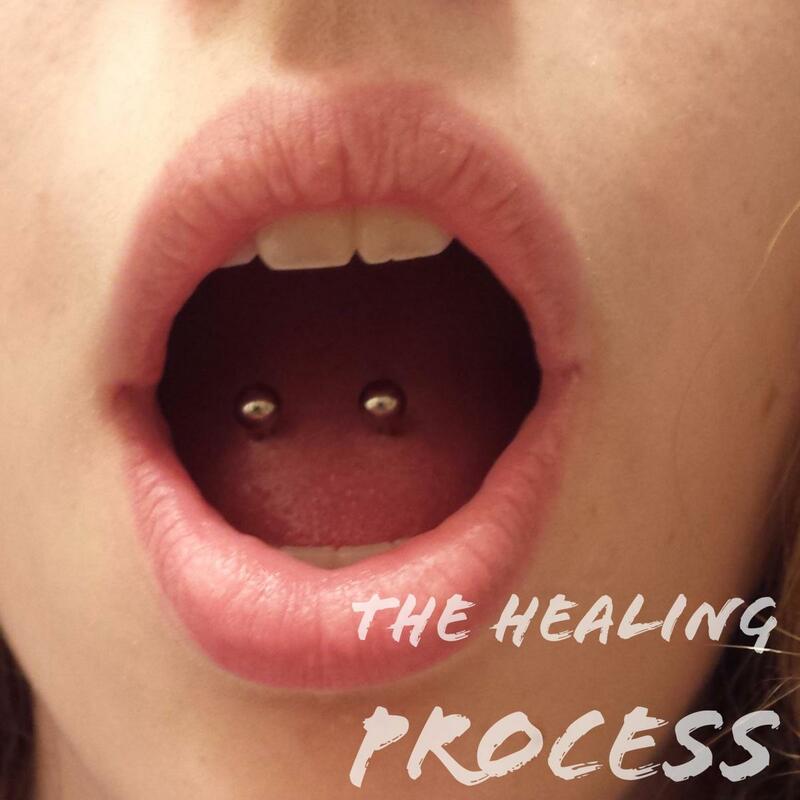 Redness, swelling, and pain is normal for a new piercing. I just got my rook piercing yesterday from orbit and i just wanted to know what is the best way to clean my piercing. Also what are the chances of my rook piercing getting infected? i clean it daily with sea salt and water. But my ear is a little swollen it could it be cause of the fresh piercing. It's normal to experience some pain and redness so early on in the piercing. Just keep in mind that those pierced with a gun experience more pain and trauma to the tissues, so you're in more pain than if done with a needle. And, you're at more risk of infection, as piercing guns cannot be thoroughly cleaned, and commonly harbor blood and debri from previous piercings. Leave the jewelry alone, and do not twist them. Also, be leery that jewelry with backings can harbor bacteria, so keep them clean. Do not use wipes, clean with saline or with a very diluted non-iodized sea salt (not table salt) mix. So I got my first ear piercings like 3-4 days ago now, on my lobes. And I've been cleaning them with these anti-bacterial wipes. But the thing is my mom said to twist them round, like in a little circle. I know she's probably wrong cause i've read up top before that not to do it. Both the lobes hurt though my left one hurts more than my right, my right hurts a little but only if you actually bang it by accident, whereas the left one hurts at a simple touch. What should I do? I clean it when im in the bath (well just like rinse it with water) and once in the morning and once at night with the wipes. Any more suggestions, and will it ever stop and eventually go down? $40 for one is about average and $35 each for both. That's what I was quoted the first time, and the second. One piercer wanted to charge like $50 for one or $40 each if I got both. I read that you have both of your inner conch pierced and I was wondering how much you paid for them. The place I want to go to says its $40 for one and I wasn't sure if that was normal because it seemed a little high. If the jewelry was the butterfly backed jewelry, you need to find safe jewelry. If you got them pierced with a piercing gun, that's caused a lot of damage, more than necessary, increasing risks. The only thing you can do is let it grow in and have it properly pierced, or force it in and risk complication. If you forced it in, use saline or diluted sea salt and clean the era twice a day. I got my ear lobes pierced about 7 weeks ago and am now wearing regular earrings. I took off the earring in my left ear yesterday because it was irritating my left ear (my left ear felt very sore). I then cleaned the left ear with Claire's aftercare solution and it seemed fine. But this morning when I try to put back the earring, it seemed like the ear hole has closed up. I tried to put the earring through but it keeps on bleeding. ieatrainbows, Claire's and any place who uses piercing guns is not an ideal place to get any piercing. The piercing gun causes a lot o trauma and potentially more damage than the piercing needles. Plus, the butterfly backing jewelry can harbor bacteria and cause infection. Leave the self pierced piercing along and try to heal it. If you take the jewelry out and try to close it up to be properly pierced, you can potentially close the infection into the body. You don't want to use table salt. You want to use SEA salt, and you want it to be very diluted. You can also use saline solution, which doesn't have to be mixed, which makes it easier. Tasherr, it is possible that your body just won't heal piercings at all. You can get the navel piercing and try to heal it, but you may encounter the same thing. It's hard to say 100% for sure what will happen. I Am Planning To Get MY Belly Button Pierced In The near future but i am very worried that it will get infected because i have had my ears pierced from a very young age but at about the age of 11-12 they started to get badly infected and i could never wear earings, i have tried different types of metals, silver, gold and all that but nothing seems to really work for my ears, that's why i am concerned that my belly will get infected just like my ears?... is there anything i can try or do to prevent my ears from infection and because of the ear infections, would it be best not to get my belly pierced..? thanks for being so helpful ive been reading all your replies, what do you do for a living are you a piercer how do you know somuch about them? hey i just peirced the top of my ear 3 days ago half of my ear is swollen and red is it normal or its infected...? It's a new piercing. Bleeding is normal. If you have a clotting problem, then that could be a concern. ok so i just got my rook pierced a couple hours ago and it hasn't stopped bleeding since, and i've been cleaning it every hour with saline and i keep getting these chunks of blood, i hope that's normal? also, my whole ear is stiff and in pain, what do i do? It's probably just irritated. Try cleaning it with some saline for a few days.